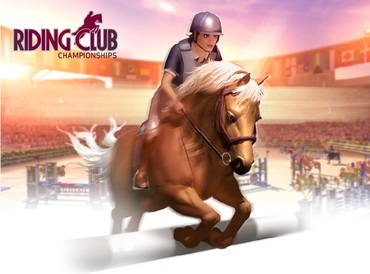 Riding Club Championships, a super fun interactive horse game, is now on Facebook. If you played this game before it moved to Facebook I do not believe your account transfers over but I'm not one-hundred percent sure about this. Either way, though, this game is still a lot of fun. You get to train your horse for jumping competitions and when you are ready you can compete with your horse against other players in different competitions. This game definitely has some of the best graphics I’ve seen. The people, horses, and courses are very realistic. This game now also features goals for you to complete, and when you complete them you get rewards like diamonds and or money to buy gear for you and your horse. You can also buy other cool and fun items using your winnings or you can spend real money to earn money in the game. My sense is that now that more people play this game it tends to run a little slower than before. And I do not know if they got rid of it or if I just can’t find it, but I haven’t figured out where the barn is or how to groom my horse. I also don't know if you can buy another horse. 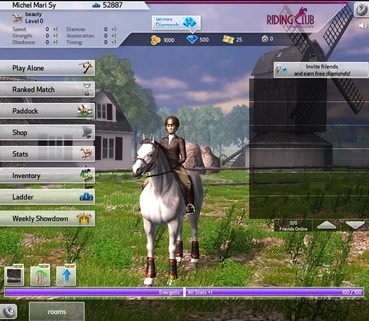 Have you played Riding Club on Facebook? Share your review, tips or questions in the comments below! And I don't want one! But I want to play this game! 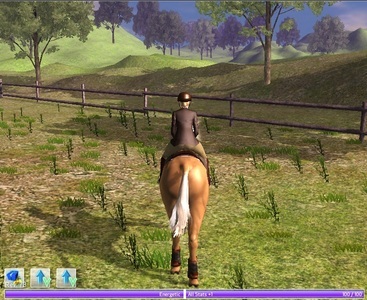 I played this game before it went to facebook and I loved it, I thought it was the most amazing horse game ever. When they moved it to facebook they changed the look of the horse (most minor thing they did) but they also changed the controls and the game play. The game runs slower and the movements of the horse look terrible now, I'm really upset that they moved it to facebook, or at least that they didn't make a paid version of the game if they couldn't upkeep the game anymore or something. This game is so cool! Can't wait to play it. Apparently you can no longer use the Google Chrome browser to play this game on Facebook. You will have to switch to a different browser if you want to play. i play this horse game all the time on Facebook. it's so fun! hey guys i have a mac and its graphics are like tots amazing so awesome! But to get over the 4 poles you have to full on gallop before it, but if the horses gallop period doesn't last very long then you have to hold it down shortly before.. It takes practice but once you've got it its easy! How do you get over those really huge jumps? The wide ones with about four poles? This game is on FB. You need the unity web player which you can download easily. If you have any questions don't hesitate to reply back with subject "RCC help" . This is a EPIC game, I love it! Oh come on. Stop being that way. It is NOT rumor! Go check their page if you don't believe us. how do you play the game? there is nothing. how do you get to play it? when I download it, it says it's out of date. you need a facebook account in order to play it. on Facebook only. Sorry! more added to Riding Club Championships! woo!! Riding club now has grooming, agility courses AND you can build and play your own courses! Riding Club Championships is AWESOME! I just wish it can be put on iPods so i can play where ever i go. i've been looking for this game forever. how can you get another horse? plz tell me. I never really played this game. I only saw pictures. Could anyone tell me how to play, please? I loved the game! It' soo much fun! this game takes too much time to load and if the energy is over that's all. THIS IS THE AWESOMEST GAME EVER!!!!!!!!!!!!!!! you need to download some unity thing and then if it's your first time it may load longer. it works now and it's awesome! On Horse Stars Facebook- page they say that this will NOT be a Facebook-game, it will be an online game. Hi everyone, Horse Star will NOT be a Facebook game, it is only a rumor! Horse Star have said so on their Facebook page, it will be an online game! love the game, am going to download it. The game is different from before it was on facebook. There is no more grooming, instead you have stamina which regenerates in less than an hour I believe. Stamina effects the stats of your horse. You can level your horse to make it better at 6 different stats, all which affect how well you will do in jumping courses. I like the leveling part of the game, but stamina for me is a huge game play kill. You run out of stamina after jumping 5 courses. You can refill stamina but it takes diamonds and you earn small amounts of diamonds as you jump courses but otherwise you have to buy diamonds. The game is still in beta mode so the controls aren't the best yet.